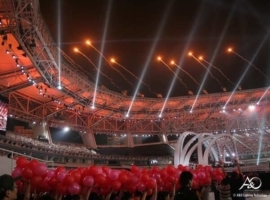 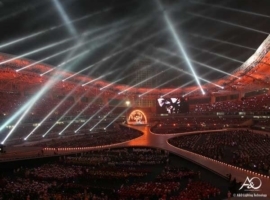 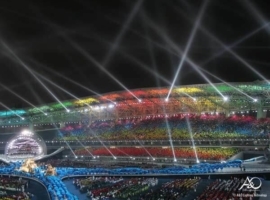 A magnificent opening ceremony attended by over 70,000 spectators and almost 7,500 athletes from 165 nations got the Special Olympics off to a spectacular start on the 2nd October in Shanghai. 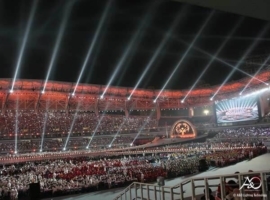 It was the first time the games for people with intellectual disabilities had been staged in Asia. 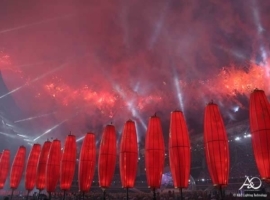 This was the largest sporting event ever hosted in the Middle Kingdom and served also as a dress rehearsal for the Olympic Games, which will be held in Peking in 2008. 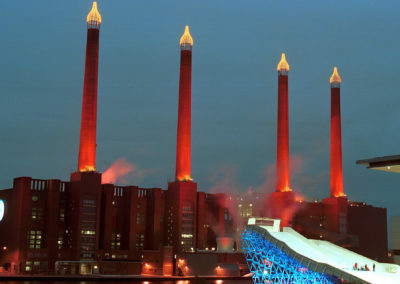 Don Mischer conceived and produced the sensational opening show to which “Bob” Dickinson’s intoxicating lighting design lent additional magic. 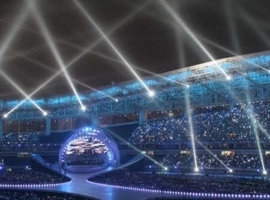 For the equipping and implementation of the show, the internationally celebrated lighting designer relied inter alia upon A&O Lighting of Oyten, Dickinson and A&O Technology having worked together successfully on major projects on previous occasions, including the Super Bowl and the Grammy and Oscar presentation ceremonies. 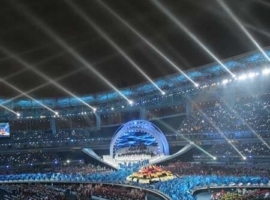 For this production, the A&O team installed a total of forty-four FALCON® 7 kW searchlights in Shanghai Stadium – under somewhat trying circumstances. 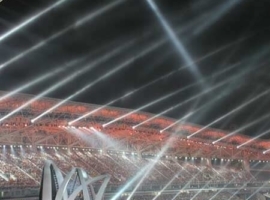 The building-up phase was nearing completion when problems with the power supply surfaced:the voltage was too low and fluctuated, moreover, under load by +/- 30V. 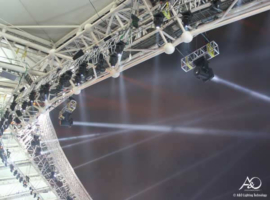 The upshot was that the supply voltage fuses of four of the FALCON® searchlights, which are designed to protect the electronics from serious damage, were blown, so the fixtures had to be lowered and disconnected from the power network. 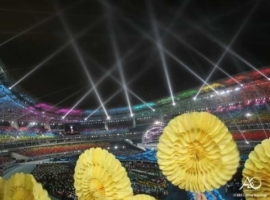 After taking measurements at various times of the day and conducting an analysis of the data, it was concluded that the Shanghai power supply was simply incapable of meeting the requirements. 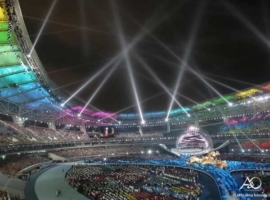 With time ticking on, the team debated the merits of various solutions before deciding in the end to integrate stabilising power supplies in the system. 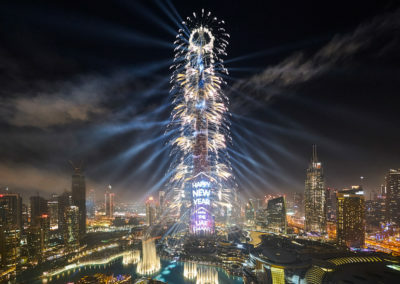 After something like two days of extra work, they eventually succeeded in obtaining a voltage sufficiently high and stable to ensure the flawless functioning of the FALCON® systems. 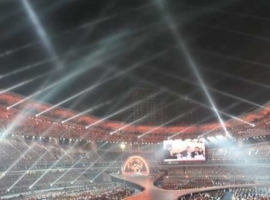 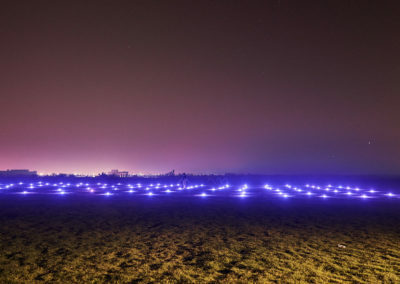 The system installed by A&O Technology comprised thirty-two FALCON® BEAM spotlights flown at a height of around 65 metres as well as eight additional FALCON® BEAM and four FALCON® FLOWER fixtures serving as floor spots and positioned in the trench between the competition area and the spectators. 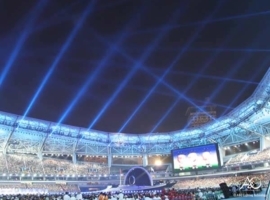 Each truss was connected to a separate (Rackland) power supply, of which there were ten in all, so that the trusses could be manoeuvred individually.